Water temperature: 39 degrees. Air temp: 36 degrees. A stiff wind was in the air; “it’s going to be a cold one,” thought Paul Mills. He went through his gear bag looking for three undergarment layers, one dry suit, gloves, helmet, mask and snorkel, and fins. 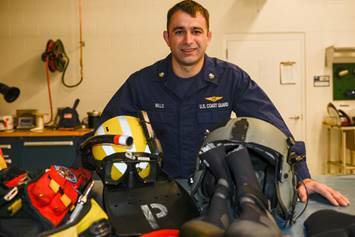 Coast Guard Petty Officer 2nd Class Paul Mills is an aviation survival technician at Air Station Cape Cod. While his skills are honed from hours of training, making sure his gear is prepared is just as crucial. “Cold weather – it’s less about training and more about the equipment that keeps us alive,” he said. “Preparation can be the difference between life and death,” said Mills. Cold weather gear is required to be worn when the water temperature is 55 degrees and below. 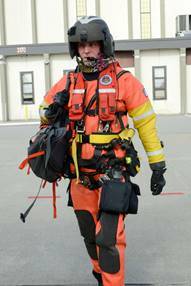 The water temperatures in New England can get below 30 degrees, but that doesn’t stop a well-dressed crew. “During a [search and rescue] case, I’m jumping in to save a life no matter what,” said Mills. He said it’s not just the water that’s cold, but the wind too. The three layers of undergarments, similar to long underwear, are warm. Next, the dry suit, which is leak-tested to make sure those undergarments do not get wet, keeps the core of the swimmer warm. The harness goes on after the dry suit. 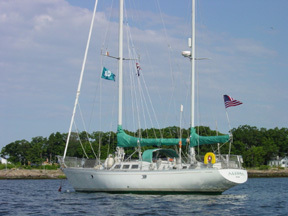 It connects to the hoist hook and contains all of the rescue and survival gear. “The harness is full of pockets holding supplies such as a strobe light, a knife, a personal locator beacon, a radio, and a flashlight,” said Petty Officer 2nd Class John Brennan, another aviation survival technician at the air station. According to Brennan, a rescue swimmer in full cold weather gear can survive in the water for roughly 14 hours. Even though the weather changes, the training doesn’t. Mills works out three days a week with his crew and swims two days a week. In between, he goes up in the MH-60 Jayhawk helicopter in full cold weather gear and conducts hoist training with local Coast Guard small boat stations and cutters in the area. 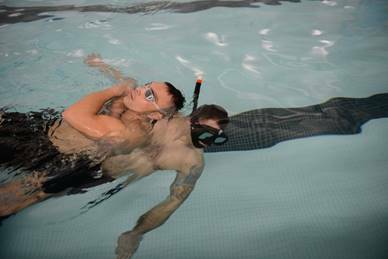 The swimmers and aircrews conduct training hoists during the cold weather, but are cautious of the weather conditions. If the weather is bad, there is no reason to put a crew at risk when a life is not in jeopardy. Hoist training is just part of how Mills and his team stay prepared to face the chilling cold water during a search and rescue case. During certain times of the year, the swimmers train at the beach. They practice going through the surf and conducting rescues using a dummy or each other as victims. When there is a search and rescue case, the water temperature doesn’t matter, because the risk is always measured against the value of saving a life. Mills said he relies on the gear he has to do its job and protect him from the cold. And as his crew members agree, dressing for the weather is the best policy. During winter 2015, the air station crews did power through it. Air Station Cape Cod performed over 250 rescues and saved about 80 lives. Last winter, Mills said he was personally involved in five search and rescue cases where lives were saved. But there were other cases that didn’t end as well, he said. “There were four cases where lives were lost to the cold water,” he said. The cold takes lives, it’s best to be prepared with proper gear to withstand the frigid water.